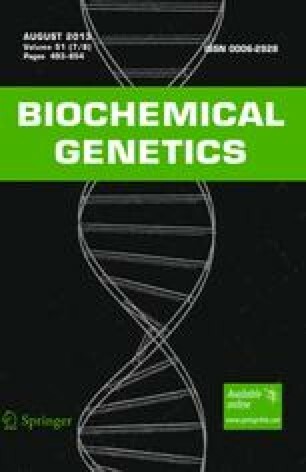 A mouse with X-linked glucose-6-phosphate dehydrogenase (G6PD) deficiency has been recovered in offspring of 1-ethyl-1-nitrosourea-treated male mice. The activity alteration was detected in blood but can also be observed in other tissue extracts. Hemizygous, heterozygous, and homozygous mutants have, respectively, about 15, 60, and 15% G6PD remaining activity in the blood as compared to the wild type. Erythrocyte indices did not show differences between mutants and wild types. The mutation does not affect the electrophoretic migration, the isoelectric point, or the thermal stability. Kinetic properties, such as theKm for glucose-6-phosphate or for NADP and the relative utilization of substrate analogues, showed no differences between wild types and mutants with the exception of the relative utilization of deamino-NADP which was significantly lower in mutants. This is presently the only animal model for X-linked G6PD deficiency in humans. This research was supported in part by Contract BI6-156-D from the Commission of the European Communities.